You never know when something might spark their interest. But one thing is for sure, something wondrous that Jack discovers on his own is far more magical and engaging than anything I could prepare for him. 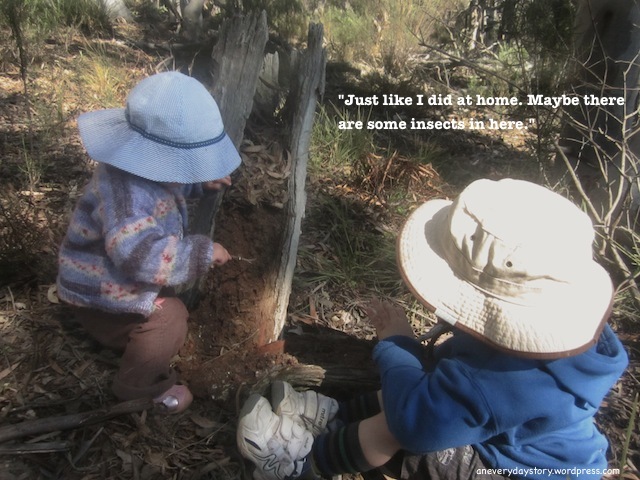 One afternoon we were playing in the backyard, Jack was climbing on one of the stumps, he lost his footing, slipped and as he fell a large piece of bark came away from the stump. 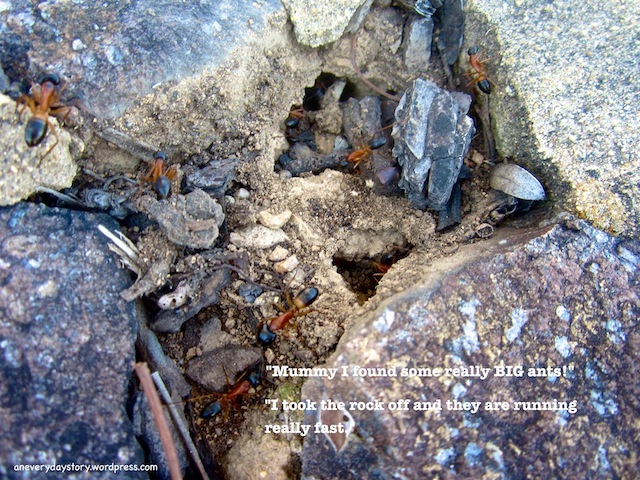 There were bugs everywhere, hundreds of them, ‘Mummy! Look what I FOUND!’ Jack yelled excitedly. Moments like these happen all the time; something new and interesting catches Jack’s eye, but it took me a long time to recognise these experiences as opportunities to explore further, an opportunity for a project. Honestly I think I missed a lot of them, a lot of oh yeah, that is interesting and then the next day back to something I had planned, moving on without a second thought. It took me a while to learn to listen to Jack and from there, how to speak with him in a way that would encourage this fascination and not stifle it with all the answers. and then always follow through with their suggestions. 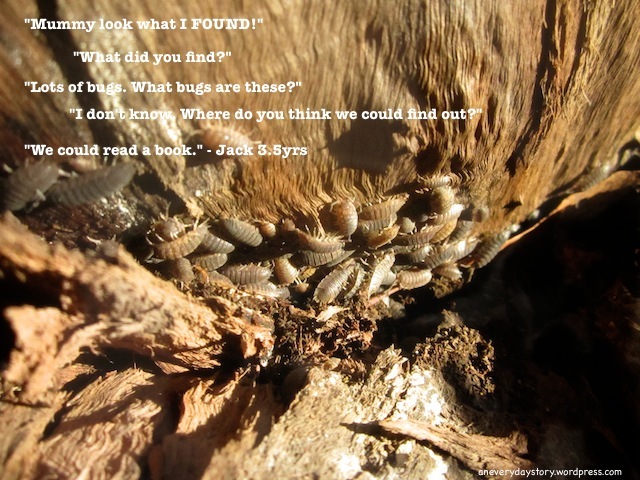 In this case, Jack wanted to know the name of the bugs, I didn’t know, so I asked him, ‘Where do you think we could find out?’ He suggested we might find the answer in a book. So off we went to find a book. When starting a project, and in fact the entire way through, it’s important to continually revisit things, as Lori says, lay down multiple layers of learning, rather than doing activity after activity. With the bugs, we returned to the stump the next day only to find most of them had moved on. Jack was disappointed. It’s hard to not jump in with answers or suggestions, I still need to consciously remind myself that this is Jack’s learning journey; he leads the way. I probably would have suggested a bush walk anyway, but would Jack have been as enthusiastic about the walk if he hadn’t suggested it? 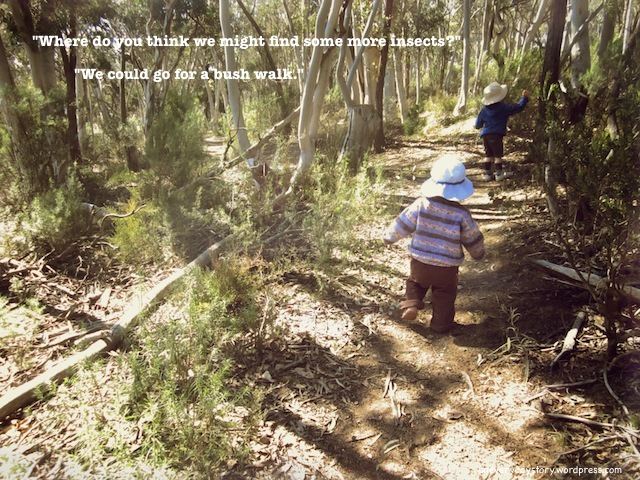 He really enjoys bush walks but in this case he was entirely focused on finding more insects. Would he have been this interested had I suggested the walk? Or would he have just explored more freely like he usually does? Hard to say, but in this instance he had a definite purpose of finding more insects. 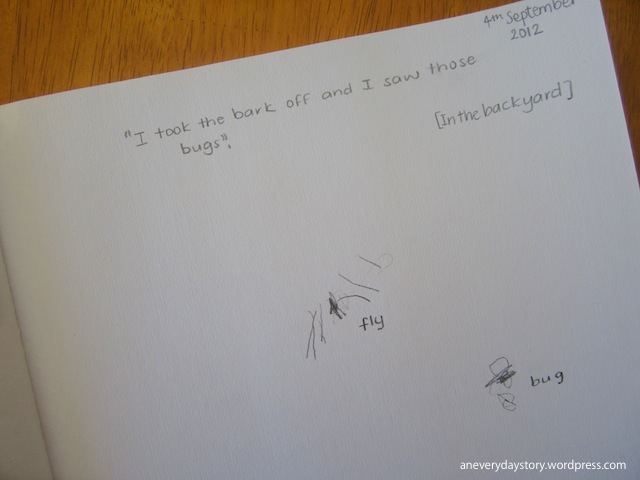 The evening after the bush walk I put his journal, the book we originally read about insects, an ant figurine, his clipboard and a pencil on Jack’s bedside table. 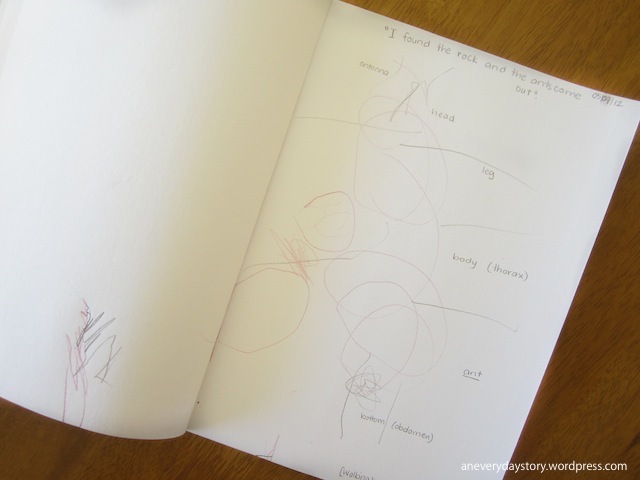 I’ve found journal writing to be a really engaging way for Jack to recall his experiences and bring his ideas together. Jack will write and draw in his journal. I label his drawings and write a description of the journal entry up the top. 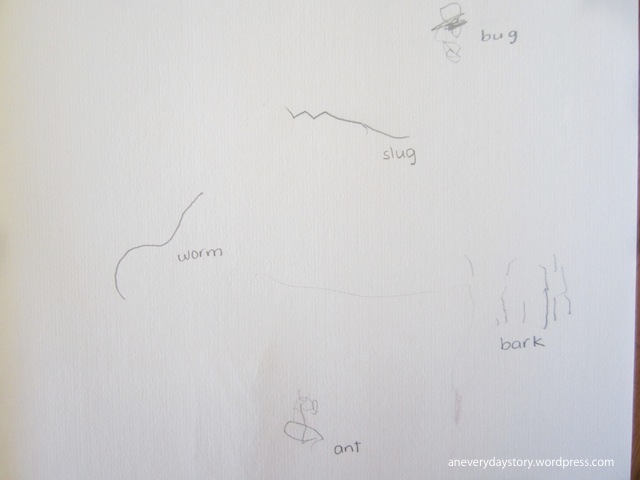 I have some word cards with project-related words (ant, antenna, leg, bug, dirt etc.) which Jack can use to help him label his drawings. or just waiting to see how Jack is inspired, and follow his suggestions. I am learning to listen to Jack, hear his suggestions, value them, and follow through. And honestly, once you get the hang of it, of recognising their interests and hearing what they say, it is so much easier and less stressful than trying to think up new one-off activities all the time. 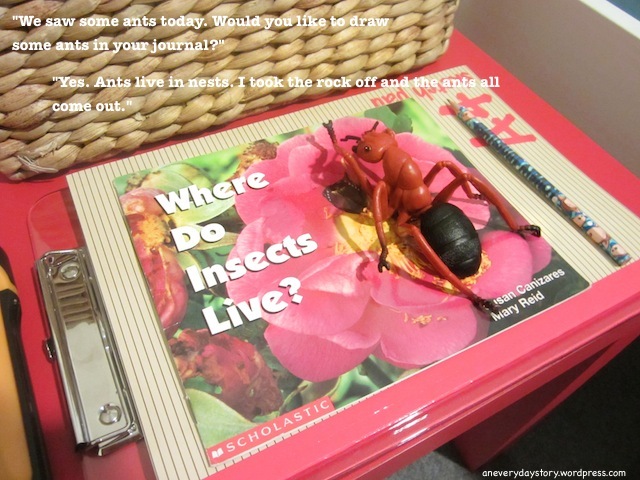 So far Jack has wanted to use his bug viewer several times, take a few bush walks, return to an ants’ nest in our neighbour’s yard, draw in his journal and play with his insect figurines, nothing too complicated there, but all Jack’s suggestions and all wonderful experiences. Thanks Lori. I am getting so much from your book. I thought that I had a pretty good handle on things from teaching but there are just little things, little changes which make such a profound difference. Like following his suggestions or more importantly, waiting for Jack to speak, to hear his observations and thoughts. I think usually when he sees something I would tell him what was happening. Waiting in silence is tricky but so worth it. small changes that make a profound difference — i’m so glad you are sharing your experiences. so many people are going to benefit from reading them! someone from the PBH forum was unable to post a comment here and they left a post for you in the forum — be sure to check it out! Yes! I think I evolved this fall-back method a long, long time ago, when I first began in environmental education. I always felt things went best when I had the space and time and permission to be flexible and follow the kids’ lead, rather than having to follow a set program & script. And I honestly don’t know how or why (it certainly didn’t grow out of my own educational experiences! ), but very early on my stock answer was “let’s find out–how can we do that” rather than just answering the question. The sweet little secret, the thing people just don’t realize until they try it, is that this takes so much of the pressure off the teacher/parent/group leader. It’s not our responsibility to fill every moment. Ahhhh. We can just enjoy it right alongside our kids. It does take the pressure off, doesn’t it? I also like that it teaches the child that information can be found in many different places; books, internet, other people, experimenting, investigating, not just from us. I think I used to say something like, ‘let’s find out’ to my students when I was teaching but I think I still had in my mind that I knew the answer and the best way to approach something. I am starting to let that go though and follow Jack’s suggestions even though they may not lead to anything, or to failure, because even in failure he is still learning. failure is really essential to learning! i really think that learning this way is three-dimensional vs. the flat two-dimensional version of just showing the child what you want them to see. letting them range about, pick it up, turn it this way and that, examine it from all angles, poke at it, figure out what works and doesn’t work — that kind of full-on investigation has a much more lasting impression. Thanks for this post. I’ve heard quite a bit about Project-Based Homeschooling recently and your post was the prompt I needed to get round to ordering the book. Looking forward to finding out more about it! Thanks Kellie. I got Jack’s bug viewer from the Australian Geographic shop. It was $16.95. 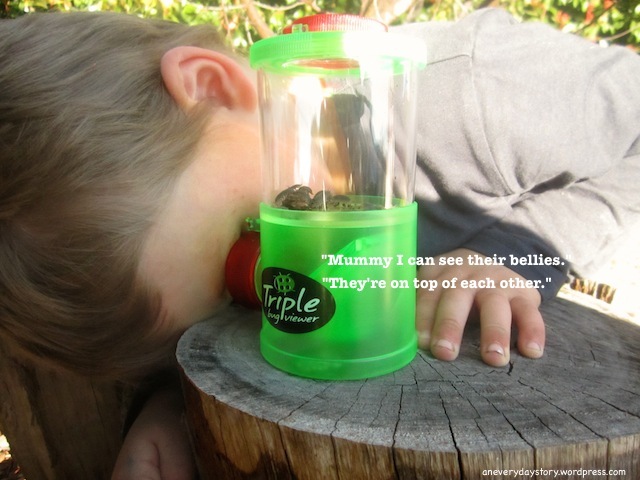 It’s a really great one because you can observe the bugs from the top, side as well as from the bottom. It’s one of Jack’s favourite things at the moment. The more I read the more I am inspired. It’s so simple isn’t it? Why do we spend so much time trawling Pinterest and other places when all we have to do is just listen to our children? And like you said, the things you are doing aren’t complicated at all, we don’t always need to be moving on to the ‘biggest and best’ creative activity all the time. It really is so simple! Such a relief! Fantastic – what a beautiful blog and fantastic post. I look forward to reading more of it. I believe in the same thing and try to build on learning. I love reading about others who use what’s right in their own backyard! Thanks Heather. We are definitely still on a learning curve. I still find myself missing opportunities for deeper learning but We’re getting there. It’s as much a new way of learning for Jack and Sarah as it is for me. I’ve learned so much from this, thank you. You’ve set it out an a really understandable, relatable way. being silent is really hard for me, working on it! 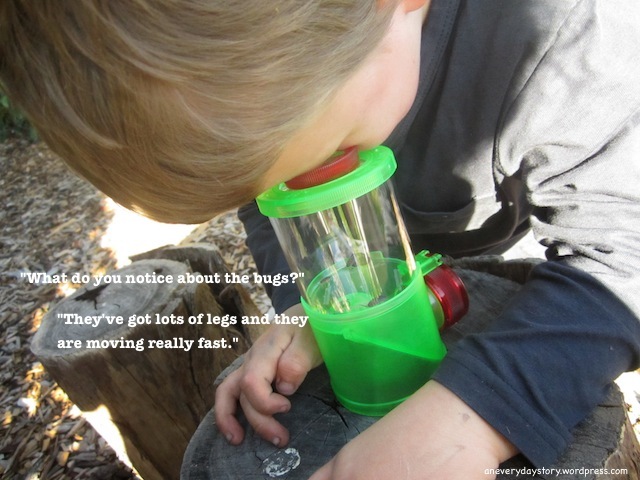 I just followed a link from Loris PBH blog and found this post. I just finished reading Loris book and it was great to read how it actually gets put into practice. Especially since Jack is so young and it would seem harder to do it with such young kids. having run a reggio-inspired preschool for many years, i think it’s probably the easiest age to work with! so many ideas, so much confidence, so much energy and joy in learning — they just need the support and they GO. Lovely to have you pop over 🙂 I think like Lori said, working with Jack at 4yrs old is relatively easy because of his thirst to know and understand and explore. I know that a lot of the examples Lori gives in her book seem to be aimed at older children, ideas like researching, making notes and representing ideas but I’ve found that pre-writers and readers like Jack are able to do this too through talking and drawing and play. How old are your little ones? we had a visiting educator comment that our preschool students were doing more serious and in-depth research than the middle-school students she worked with. even though they were mostly pre-readers, they researched, they took notes (often visual), they compared sources, and so on. they had very complex ideas and complex representations to go with them! Hello! Please tell me a seleccion of questions you did? It is also important for me ….. Iam learning, thanks.